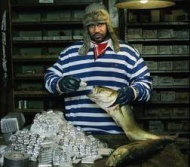 Ahora puedes escuchar y aprender la canción "Churchez laghost" de Ghostface Killah. snuck through the back door, guess who they saw? Escuchar Ghostface Killah Churchez laghost Lyric Video.